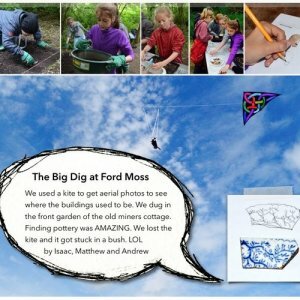 Flodden education staff and class teachers from Duns Primary School worked together to plan and deliver an extensive and varied series of Flodden workshops, site visits and experiences for primary 7 pupils during the 2014/15 academic year. Pupils participated in Flodden outreach workshops in school and visited Ecomuseum sites, near and far, including Etal Castle, Heatherslaw Mill, Flodden Field and Stirling Castle. The class also joined professional archaeologists on the Ellemford excavation and The Big Dig at Ford Moss.